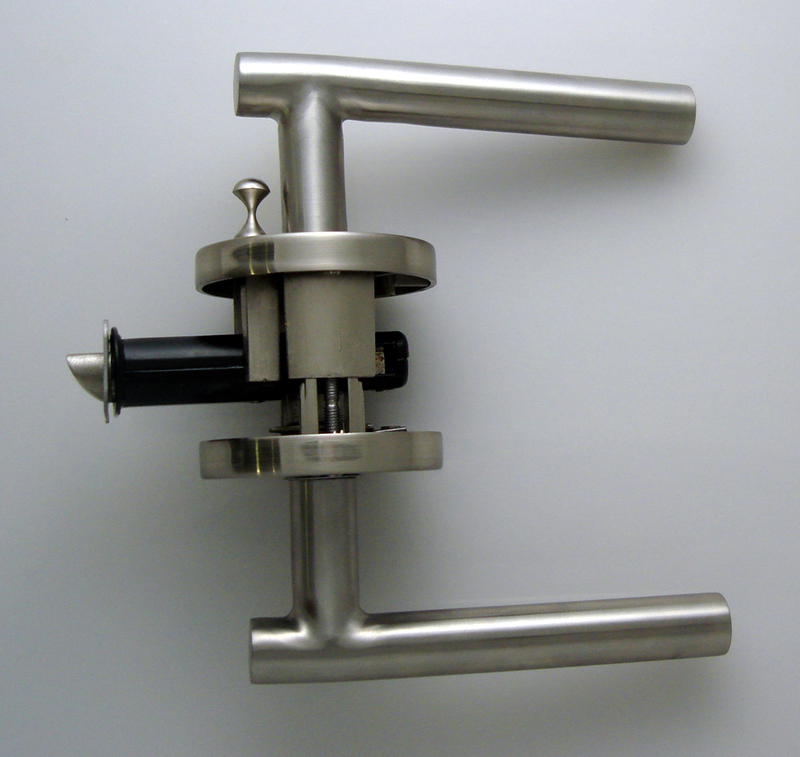 The Juneau Modern Satin Stainless Steel Lever Handle is an excellent value. 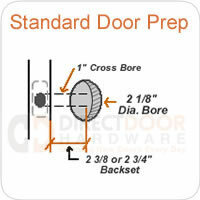 You can compare this door hardware at near twice the cost or more at other hardware retailers. We passed the savings on to you, offering this hardware at direct pricing. 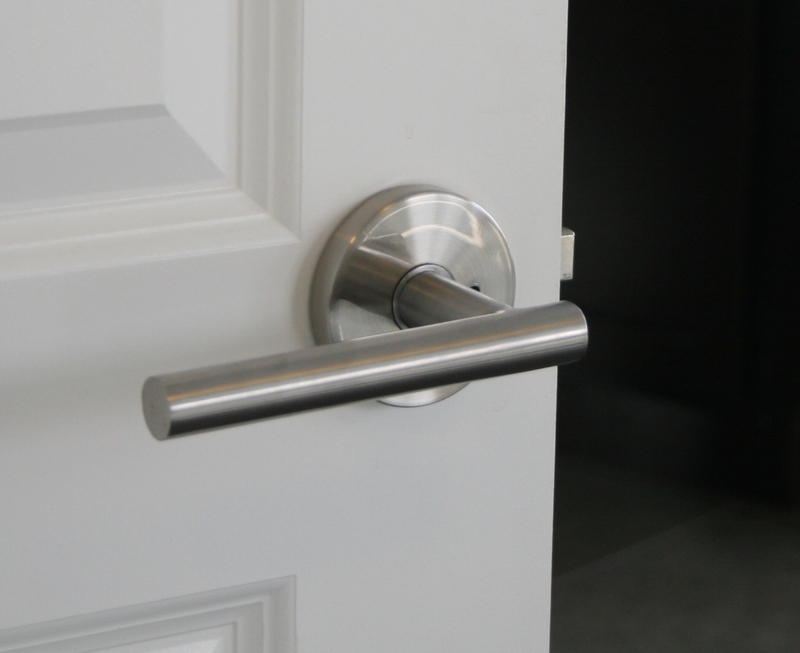 Give your new or existing home the luxury feel with lever handle hardware most often found in high end custom homes! The Juneau lever is a modern door level that has both style and durability. It looks similar to the Oslo lever, but with less curve. 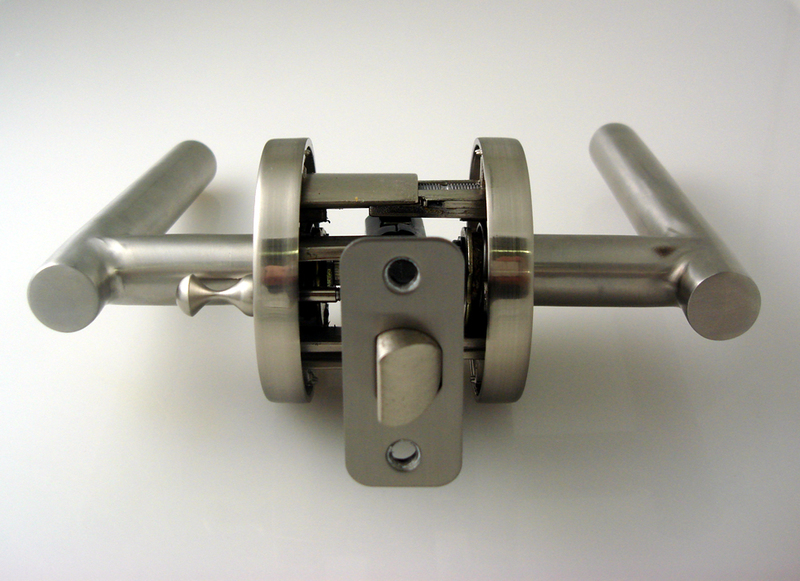 - There is no Keyed function for the Juneau Lever because it would change the design significantly. We recommend using a passage lever with a deadbolt above. Requires a hole drilled through the door, will have a lever for one side of the door. Dummy levers do not have a latch or mechanism of any kind. The Sure-Loc Juneau Lever requires a hole drilled in the door to mount the dummy function and will have a lever for one side of the door. Love these levers and Direct Door Hardware! Love,love,love my new Sure-Loc Juneau Modern levers. These are even sharper then handles I looked at that were more the twice the cost! These really are a champagne product at a beer price! I could afford to put all matching handles on my front door and all my interior doors which really make my little home much more pulled together. And Direct Door Hardware was fabulous! When one of the levers didnt work, I called on a weekend & left a message and someone called me back first thing Monday morning and shipped me out an new lever ASAP! So I got champagne customer service too. This is the happiest I have been about a purchase in forever. Thank you Direct Door Hardware! I figure with all the time I've been standing around salivating at my choice of new doors levers I could take a moment to wipe up my drool and post a review. I purchased a houseful of Sure-Loc Juneau Modern Levers to replace mismatched levers and knobs that I inherited when I bought my home. I can't speak to the installation except that, save for one passage door that my contractor claims I mismeasured (but he managed to finagle to make work), my contractor installed the levers fairly quickly, and they fit my doors perfectly. Doors that didn't used to close correctly are now all snug. The levers are solid, look great in my modern decorated home, and what I notice the most is how good they feel in my hand when I'm using them. They feel solid, big, but not overwhelming, and just the right weight. I have some French doors and frosted glass doors, and the levers pair well with them, as well as my solid wood doors. I could not be happier with my choice. My only complaint is that I didn't order them the day I moved in. Highly recommend. I recently bought a 20-year old production house. It needed some uplifting. I replaced the cheap door handles with these Juneau and it made a big difference. They are big, look great, and you can feel the quality. Installation was a piece of cake. Great looking!! !Well made!! !Reasonable price!! !Easy to install!! !We just now installed them in our new house!! !If you like modern style-this one is for you!!! We ordered many things for our remodel but I'd have to say these Juneau Handles were one of my favorite upgrades. Solid, well made, and easy to install. I like that you can turn the lever up or down to open the door. Also, the smooth action doesn't require much of a turn to open. Only downside is the privacy push button is easy to accidentally bump and lock. Fine if you are inside the room, but a hassle if it happens with a young one inside. Overall, really quality product at a great price! The levers are easy to install. The privacy function is simple to use and works well. They look fantastic and I'll be buying more. We bought these handles for our house remodel. They are on our french doors inside and out along with dummy handles. I loved the look and the price but I have already had to replace many because of the drooping. The drooping is mainly on all the outside doors, I think because they get the most use. They looked amazing at first but within the 1st month with contractors pulling them open they quickly fell apart and started with this drooping. I was so sad to have to return these beautiful levers, but our new doors didn't have a flat cutout where the strike plate around the plunger goes and this particular handle doesn't come with an interchangeable round plunger. They were extremely helpful on the customer service end trying to help us and coming up with an alternative lever. I like the new lever, but not as much as this one. Oh well. You can't beat the quality, function and price of these mod handles. A great buy! Excellent product, looks right, feels right, function and quality. My contractor was very impressed!! These handle sets are solid quality and a GREAT value. Nearly 1/2 the price of some other brands. I used a much pricier brand on our other home. They were stainless too and had a little more design detail to them, they were not worth the difference of $80+ each and I don't think the mechanism was quite as solid and quiet. The "Passage Hardware" is very good looking. The scale is a bit too big. I am having a problem with the levels being parallel with the floor in the rest position. Perhaps there is an adjustment? The enclosed directions to not address this issue. For the money they are a good deal. I did not want to spend $150 per door!!! Love the look of the levers and very happy. Just a word of warning, when you lock the lever, it does still turn and bit and can unlock the door if the strike plate isn't perfect. I was looking for a well-designed lever, clean lines, brushed nickel at a good price for a contemporary loft bulid out that I'm doing and these were perfect. Exactly what I was looking for. Good hand-feel (only turns 45 degrees instead of 90 to open), and very well made. Would buy 1000 more of these if I needed them. The levers are perfect. We have a contemporary home and these fit the style. The are solid and heavy. They look and feel much more expensive than they were. GREAT BUY!! This handle adds just the right look for my modernized decor. It feels substantial, and a nice and limited range of motion to open the door (unlike the Schlage which needs to be turned nearly a full 90 deg. to open the door). I love the price. So glad I found this as I was about to buy the Emtek modern handles for nearly 3x more $. I was shocked at how expensive modern-style door levers are so looked online to find a better deal. I was thrilled to find this design at a reasonable price. The look and feel was very close to what I wanted. The workman who installed them said they were easy to work with. Yay! I really love this door handle. It looks very modern. It looks great in our house. The price is great too. The door handle has a really good feel to it as well. The installation was easy. I would recommend this door handle. I was so happy to have found the modern door knobs I was looking for on the home page of your site. They are a perfect complement to my condo's contemporary decor. Absolutely LOVE the look! Thanks so much for making a high quality product at an affordable price! We are building a new ultra modern house and these levers were the perfect choice. They are the perfect style and a great value. We looked at many other options, for alot more money, but just could not beat the look and price. The levers feel good to operate and are solid. I recommend them if you are looking for a particular style on a frugal budget. Great and stylish, the only drawback was the screws in the box were a different thread and I had to go buy metric screws at the hardware store. Other than that, nice handle. Looks and works great! Does this lever come in a keyed version that I can use on an exterior door? The do not make a keyed version of this lever. They would not be able to retain the sleek modern look with the key cylinder and housing required to make it work. 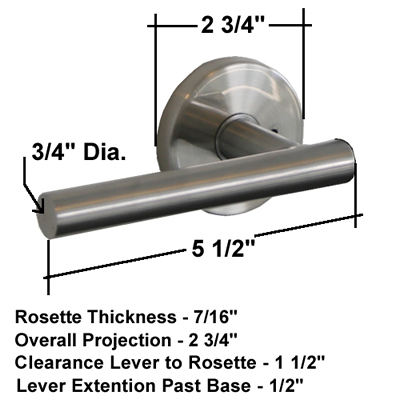 For exterior doors we recommend using a passage function with the Sure-Loc Modern Round Deadbolt above. I want to replace my existing french door hardware perhaps with this product. The existing has two movable levers on one side, and two dummy levers on the other. It also has a single cylinder deadbolt lock 121/2" above the knob lever. Do you have matching hardware on this product for replacement? can the back part of this handle be square? Hello! This is my first time purchasing door hardware, so worry for the silly question... 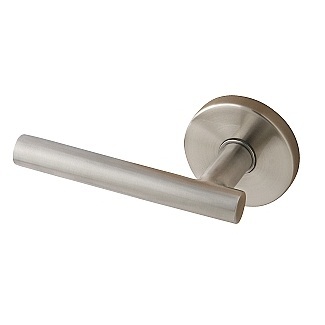 When I buy a lever handle, does the set some with both handles (for both sides of the door) or just one for one side? I'm looking at a mix of passage, dummy, and privacy. Thanks. What door widths will this lever work with. My doors are 1 3/4" thick...will this work?